The Fireface 400 is the only FireWire Audio Interface in its class with active jitter suppression, stand-alone functionality, off-line MIDI remote controllability, highly flexible I/Os in professional quality, an unsurpassed 648-channel matrix router - at sample rates up to 192 kHz. A word clock input and output (BNC) plus two MIDI I/Os (breakout cable, 5-pin DIN) complete the analog/digital feature list and turn the Fireface 400 into an entire audio system of the highest quality. Eight inputs and outputs (balanced, output 7/8 unbalanced) with software controlled switching of the reference levels (-10 dBV, +4 dBu, Lo/HiGain), of course realized discretely in the analog domain, guarantee highest dynamic range and highest fidelity. The Fireface 400's front panel features 2 balanced microphone inputs with a digitally controlled input stage, individually switchable 48V phantom power, and Neutrik Combo connectors for XLR and TRS. These can also be used as additional line inputs. A pre amplification of up to 65 dB, adjustable in steps of 1 dB over a range of 55 dB, exceptional EIN performance even at low pre-amplification settings, and extremely low THD+N let these preamps surpass those of other devices that cost several times the price of the Fireface 400. All level settings are 100% reproducible and can also be adjusted by software comfortably. Inputs 3 and 4 are extremely flexible balanced universal inputs. Firstly, they operate exactly as inputs 5 to 8 on the rear and can be adjusted to accept standard studio input levels (+4 dBu, LoGain). Furthermore, the input impedance can be switched from Line (10 kOhm) to Instrument (470 kOhm). An additional analog input amplification of up to 18 dB (in steps of 0.5 dB) is also available. In short: There's no signal that these inputs can't deal with perfectly! Inputs 5 to 8 on the rear feature RME's proven level references. -10 dBV, +4 dBu und LoGain can be selected in the settings dialog, equivalent to +2 dBV, +13 dBu und +19 dBu for digital full scale. The same applies to the balanced rear analog outputs 1 to 6. The high power phones output offers high volumes even with low-impedance headphones, and represents playback channels 7/8. All outputs can be used for ASIO Direct Monitoring purposes. 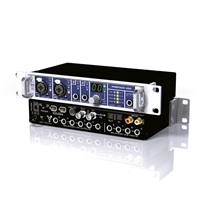 An ADAT optical I/O allows for a connection and insertion of effects devices, mixing consoles or external converters. Of course, these 8 channels are available simultaneously with the analog channels. Using an additional ADI-8 DS or OctaMic D, you'll get 16 analog inputs and outputs, which remain still 12 at 96 kHz. The coaxial SPDIF I/O , which is fully AES/EBU compatible (as is common for RME), also works up to 192 kHz, which means that at the highest sample rate, 8 analog and two digital inputs and outputs are directly available. SPDIF can also be accessed through the optical I/O, which also works up to 192k - a world exclusive RME feature. The Fireface 400 is equipped with SteadyClock™, RME's unique sync and clock technology. With this, the device becomes a sync reference for the whole studio. SteadyClock refreshes clock signals, removes jitter, and takes permanent care of optimal conversion quality, thus guarantees a sensational sound quality, completely independent from the reference clock's quality. SteadyClock allows the unit to control the sample rate freely on its own. The Settings dialog includes a direct choice of the video and audio world's most often used sample rates. Additionally, two faders can be used to set the sample rate freely and in real-time, within the range of +/- 4% and +/- 0.4%. Fireface 400 uses RME's own FireWire techology, heavily optimized for audio purposes (RME is the only manufacturer not to use a third party FireWire audio technology). Minimum overhead, special hardware adaptations, and a new low-latency buffer concept allow a performance and compatibility considered impossible for FireWire audio until now. This includes changing latency in mid-operation, latencies down to one ms, or an immediate reaction to changes of the sample rate. Further optimizations and additional features can be added at any time by Flash Updates. Of course the Fireface 400 offers a second FireWire port for hub functionality. Several devices can be connected to one FireWire interface and operated in parallel. The renowned Fireface 800 shares the same driver, allowing mixed setups. Windows2000 SP4, Windows XP/XP64: Full ASIO multi-client operation of WDM, MME (not XP64), GSIF 2.0 and ASIO 2.0. WDM (DirectSound) with stereo and multi-channel support. Full hot-plugging. Up to 3 units operational.